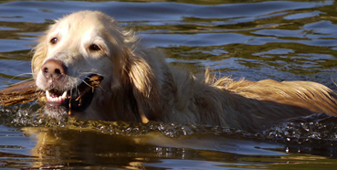 Retriever dogs are used by hunters rather than farmers and must not be the one to eye, stalk and chase the prey, and so these sections of the sequence have been hypertrophied or minimised. This means that the dog becomes oriented to the environment and the prey that is being hunted, and to a small degree is eyeing the prey but only to remain oriented in truth. Once the hunter has shot the prey, the chase takes the dog to the prey and the grab-bite is exaggerated to have the dog retrieve the prey. Retrievers are well known for loving a game of fetch as this allows them to act out the motor pattern that was bred into them - you show them the object allowing them to orient, then throw the object allowing them a small amount of use of the eye, stalk and chase, but allowing them the satisfaction of the grab-bite in order to retrieve the object for you. 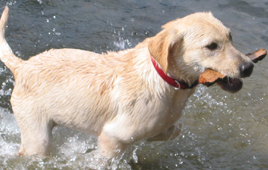 Why don't livestock guardians retrieve or play fetch? Livestock guardians are extremely poor at playing fetch. It is interesting to note that often the maremma will 'fetch' an object when thrown the first time, but will be unlikely to return it to you, but will simply run away with it, and if you take the object and throw it a second time they are more reluctant to 'fetch' it, and try it a third time and they are likely to look at you as though you are obviously a simpleton if you think they are going to engage in such behaviour! Maremmas are unlikely to ever play these kinds of games with you!